In your next assignment, you will read PS/2 scancodes from a keyboard and turn them into ASCII characters. This will allow you to type text to your Raspberry Pi. The goal of this lab is to set up the keyboard so that you can immediately start on the assignment. Install jumpers into PS/2 keyboard mini-DIN connector. Watch the signals from the keyboard using a logic analyzer. Print out the scancodes sent by the keyboard. Write code to decode the PS/2 protocol to produce scancodes. Pull the latest version of the cs107e.github.io repository. Clone the lab repository https://github.com/cs107e/lab5. Download and install the Logic application from the Saleae web site. This application will visualize the signals captured by the logic analyzer. You may also want to download the user manual. Pull up the check in questions so you have it open as you go. Most modern keyboards are USB keyboards. Unfortunately, the USB protocol is complicated; it’s approximately 2,000 lines of code to interface a USB keyboard to the Raspberry Pi. Instead, we will interface with a PS/2 keyboard, which uses a simple serial protocol that is easy to decode. The PS/2 keyboard appeared on the original IBM PC. There are two common PS/2 devices: a keyboard and a mouse. PS/2 devices connect to a PC using a 6-pin mini-DIN connector. The convention is a mouse uses a green connector and a keyboard uses a purple connector. Check out a keyboard from a TA. You can use this keyboard during the quarter, but we would like you to return it at the end of the course. Inspect the inside of the keyboard connector, you will see that it contains a plastic tab (that forces you to plug it in with the correct polarity) and 6 male pins. Two pins are NC (not-connected), and the others carry VCC, GND, DATA and CLK. Insert four female-to-female jumpers into the mini-DIN connector. Use the following convention: red for VCC, black for GND, yellow for DATA, and white for CLK. The four jumpers are a tight fit, so you will have to force them in. The good news is that once they are in, they are unlikely to fall out. We will use the Saleae Logic Analyzer to examine the signals being sent by the keyboard – please do this in groups of 2 or 3 so we have enough logic analyzers to go around. Second, familiarize yourself with the logic analyzer. One side has a USB port, and the other side has the jumpers. This logic analyzer can simultaneously watch 8 channels. Each channel has a pair of jumpers; one for signal, and the other for ground. In this lab, we will be watching the channels DATA and CLK from the keyboard. Note: Choose a keyboard without an “Inland” logo to analyze. The Inland keyboards require pull-up resistors on the clock and data lines to handshake correctly. When using these keyboards with your Pi, you will configure the clock and data GPIOs to use the Pi’s internal pull-ups. To use with the logic analyzer, we would need to bust out some hardware resistors. Instead just analyze one of the non-Inland keyboards. Third, connect the logic analyzer to the keyboard. Connect one side of a white male-to-male jumper to channel 0 of the logic analyzer and the other side to the CLK jumper coming from the keyboard. Similarly, connect a yellow male-to-male jumper to channel 1 and the DATA jumper. Fourth, plug the female-to-female GND and VCC jumpers into the 5V and GND pins on your Raspberry Pi. The ground line for each channel is directly underneath its signal wire. Recall from lecture that you need to ground each channel to the Raspberry Pi to complete the circuit otherwise it can have erratic behavior. To do this, connect these ground lines to the ground pins on your Raspberry Pi. Since your keyboard is also connected to the Pi, the two devices actually share the same ground line. Connect the Saleae USB cable to the USB port of your computer. This is what it looks like wired up. Fifth, configure the logic analyzer to acquire the signal. To access the setup options, click the up/down arrow button to the right of the green “Start”. Use a sampling rate of at least 1 MS (megasample) per second and instruct it to record several seconds of samples. Configure a trigger for the channel by clicking the button labeled with “+ wave”. Set the trigger to start recording when the CLK signal (channel 0) is falling. Once you have the logic analyzer configured, start it and begin typing on the keyboard. The logic analyzer should pop up a dialog saying that it is capturing data. After a few seconds it should return and display the data it collected. You can zoom in and out and pan left and right to see the details of the captured signal. You should see the characteristic pattern of the PS/2 protocol. The Logic application supplies common analyzers that can be applied to the captured data. Explore the Analyzers interface on the right and see what analyzers are available. Find the PS/2 analyzer and enable it. Setup the analyzer so that the CLK is channel 0 and the DATA is channel 1. The captured data is now decoded according to the PS/2 protocol and it will display the hex values sent by the keyboard. Next, disconnect the keyboard from the logic analyzer and connect it to the Raspberry Pi. 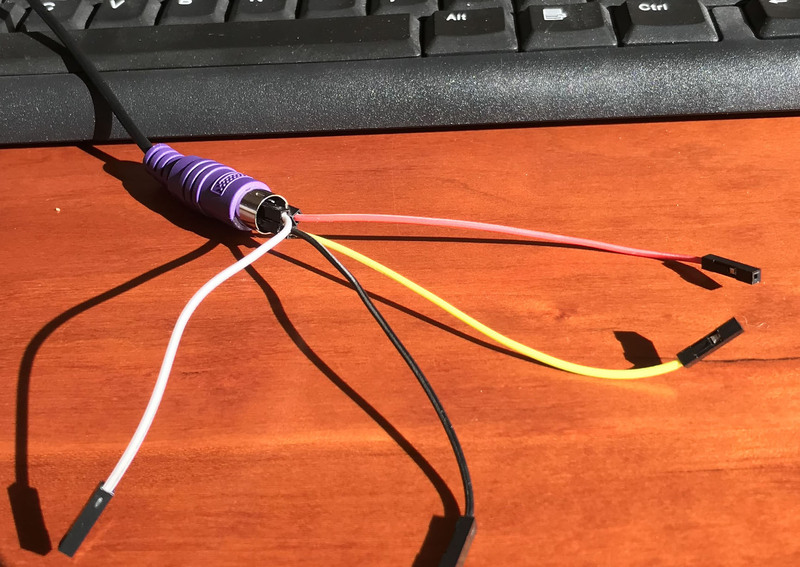 Connect the white jumper (CLK) to GPIO 3 and the yellow jumper (DATA) to GPIO 4. Here is what it should look like if everything is connected up properly. At this point, you should have a keyboard connected to the Raspberry Pi. Let’s test it using the program showed in class. Type different keys and the program should print the scancodes received from the keyboard. If they are regular alphanumeric keys, you should also see the ASCII key code. If you don’t see them, check your wiring. As you saw with the Saleae, scancodes are not ASCII characters. Instead, they have values that relate to their physical placement on the keyboard. Inside the keyboard, there’s a 2D matrix of wires that generates the scancode bits. When you press a key, the PS/2 keyboard sends a scancode. When you release that key, it sends another scancode. The scancode sent on release is the same as the first one, except it is one byte longer: it has a leading 0xF0. So pressing z will cause the keyboard to send 0x1A. Releasing z will cause the keyboard to send 0xF0 0x1A. If you hold down z long enough, the keyboard will send multiple presses (auto-repeat). For example, if you press z, hold it until it repeats, then release it and press/release g, the codes received will be 0x1A, 0x1A, 0xF0 0x1A, 0x34 and 0xF0 0x34. Try slowly typing single letters to observe the codes for press, release, and auto-repeat. Then try typing some special keys like shift. What sequence of codes do you see when you type (capital) A? What does this tell you about how your code will handle Shift or Control? As a final step, you’ll write your own code to read scancodes from the keyboard. You’ll do this in lab because it touches on both hardware and software, so it can be tricky to debug; it helps to have staff around! Go to the code/keyboard folder in this lab. This is a variant of the same application in code/keyboard_test, except that rather than using the reference implementation of the keyboard driver, it uses the one in keyboard.c, which you will fill in now! Open up keyboard.c in your text editor. For the rest of lab, you will fill in code here in keyboard.c so that the test application in main.c works. The function keyboard_init has already been written for you. It configures both the clock and data lines as input and sets them to be pull up, so if the keyboard isn’t plugged in they will default to high. We’ve also provided a tiny helper function, wait_for_falling_clock_edge. This waits until the clock line has a falling edge, which indicates the keyboard driver should read data. Fill in the function keyboard_read_scancode. This function should wait for 11 clock cycles: a start bit (which must be low), 8 data bits, a parity bit, and a stop bit (which must be high). Wait, quick knowledge check: in which order do the data bits arrive? If you want to sort out the details of the PS/2 protocol, you might find these helpful: PS/2 protocol explanation linked to as reading, and the lecture slides from Monday. This function returns the 8 data bits of a correctly received PS/2 byte. It’s important that you check that the start bit is low. Otherwise it’s possible for your driver to become desynchronized and never read correct PS/2 scancodes. In your assignment, you will also check the parity and stop bits, but you don’t need to do this for lab. If something is wrong with the data you’re getting over the line (just a wrong start bit for this lab), your code should restart at the beginning of a scancode. It shouldn’t return until it correctly reads in a scancode. So if the start bit is not 0, then your code should wait for a start bit again. As you’re implementing your function, notice how having the wait_for_falling_clock_edge function makes the code easier to read than writing out those two while loops. When you see a few lines of code replicated many places in your program, that’s often a good sign you want to pull it out into a function. If your keyboard_read_scancode is working correctly, then you should be able to compile the application and see that it can report each scancode received from the keyboard. Your final task is to fix keyboard_read_sequence to recognize when a scancode is not a standalone action, but part of a larger sequence, such as the two scancodes sent together for a key up action. Review the PS/2 documentation to see the format of those two and three-byte sequences and then edit the body of keyboard_read_sequence to read the sequence of 1, 2, or 3 scancodes as appropriate and return the key action corresponding to the entire sequence. If your keyboard_read_scancode and keyboard_read_sequence are working correctly, then you should be able to compile your application and have it act identically to the keyboard_test version you tested in Step 3. At the end of the lab period, call over a TA to check in with your progress on the lab. Before leaving lab, make sure your keyboard_read_scancode is working in the last section of lab. If you haven’t made it through the whole lab, we still highly encourage you to go through the parts you skipped over, so you are well prepared to tackle the assignment.